I decided to bite the bullet and sign up for the August 13th event at Thunderhill. It’s been almost 5 or 6 years since I’ve been on the track and I thought that this would be a great opportunity to go. It is a little difficult going on a Thursday, but I was able to get the day off to do so. My schedule has been a little hectic, and I decided that this event would be a good way for me to do something I want to do instead of something I need to do. I’ve heard that events at Thunderhill was a little thin, so even more so to do it. Should be a lot of fun. There’s a lot of good things going for Track Night in America. I like that it is an afternoon/evening event. I also like that it is a half day deal instead of a whole day experience. The cost is very convenient as well. I might get better value with a whole day event, but it is still $175, where as a half day event, even though a little more than half the price, isn’t as big of a drop in the bucket. Like I mentioned in previous entries, I am planning to take the Impreza to Thunderhill. The car has some new(er) tires on it, and was recently aligned by Auto Innovations. Just need to check a few things and it should be ready to go. I think the idea is an awesome one. It’s such a shame that Thunderhill is so far away. However, I think there are a lot of regions what will really benefit from this program. I think this is also a great gateway into motorsports. People can certainly choose to stay casual with this non-competitive environment, but for those who want to be competitive, this is a great way to get their foot through the door. 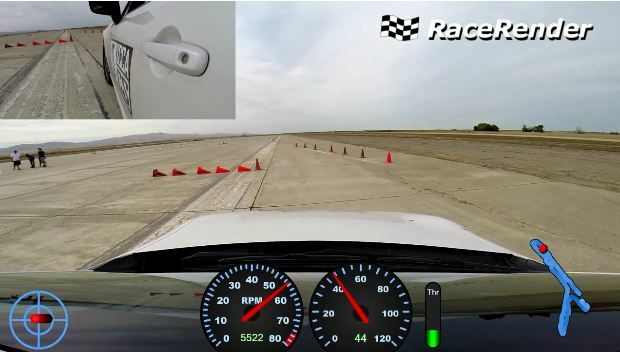 And in regards to the age old question: “track or autocross?” Check this link out. Makes sense to me! Sorry about getting an update so late. My week has been a little hectic and I haven’t had a chance to sit down and write. Round 10 has come and gone. I was really hoping to place higher in the event standings, but wasn’t able to do so. The class was stacked with a lot of top tier drivers and I couldn’t really find another second I needed to be a little higher up in the standings. No worries though. Success does not happen overnight and I will hopefully take what I’ve learn and apply it to future events. All and all, the event went very well. I was able to put down a decent time, and even though I placed 4th, the points did help. I was able to come away with a few more points when factoring in the drops. The data logging went pretty well. The data overlay isn’t perfect, but it worked way better than I thought it would. Once I set up the start and finish lines and the splits sections, it did everything I needed to do. I was able to get section times in certain areas. I was able to export specific “laps.” And I was able to import them RaceRender without too much trouble. The data still doesn’t quite sync up correctly, but I think a few more tries and some tweaking and I think it will be pretty good. What I hope to do for future events is to get a team of individuals who would be willing to working with me on plotting the course. If I could get two or three people to help, we could easily define the course then share it to the cloud where anyone can pull it and import it to their own phones. Just a thought. The car is coming along. Dennis recently had shocks installed and they seem to help. We still need to get it dialed in. The car is a little more complete now and should be a little more competitive than when it was running on the stock shocks. I think a lot of people make the mistake thinking that upgraded components always means better performance. I think the potential for performance is higher, but in all reality, a poorly configured set-up can be performing worse than a stock set-up. Anyways, the car ended up handling fairly well. With my starting our runs, I noticed that the car felt kind of slippery. Not sure what the cause was, but I was able to tweak a few things and make it feel a lot more grounded. I think I spent 3 runs total adjusting and finally got it where we wanted. In other news, I received the 924S yesterday. It has a lot of work ahead for it, but it looks pretty decent. Car has a little more than 54k miles on it. For the time being, we’ll put a cover on it and push it to the back of the driveway. Once autocross slows down, I’ll start working on it. I think what I’ll do is ask a few buddies to help me. Maybe offer food/beer for a helping hand. The weather has been brutal lately, but as soon as it cools down a little, I’ll start working on it. Who knows what this car may evolve into. 944-spec car? E-Street autocross car? Weekend car? That is to be determined. The good news is that there are a lot of replacement parts available. The next event that I will be attending will be the Santa Clara Corvette event on August 1st. Going to go down to Marina and drive the Impreza. I am planning to go out there and have some fun while hopefully introducing a few friends to autocross. The next SCCA event is August 9th at Crows Landing. That’s going to be the final event for this year’s championship series. Round 10’s course with extremely fun, but extremely difficult. The showcase turn made or broke it for a lot of people. My fastest time of the day was my 4th run which clocked a 48.742. I was carry a faster pace with my fifth run, but spun out right before the lights. Go big or go home, right? Added $1 to the cone jar for an apex cone I tipped on my first run. Otherwise, the rest of the day was uneventful. C-Street was a stacked class this event. A lot of high level drivers really booking it. 4 of the 7 drivers PAXed in the top 25 this event. So… I did it. I just put in a deposit for an SA2015 helmet. I came across the helmet while flipping through one of the Sports Car issues and thought was an excellent product. The full price of the helmet is going to be $500 after everything said and done, but to be perfectly honest, I think it will be worth it. The helmet I have now is a Bell M2005 motorcycle helmet. I’ve extensively used it over the last 8 years and I hope to use this new one for the next 10 years. If I continue using the helmet as much as I have been, this purchase will totally justify itself. I figure that if I am going to use it that much, I might as well get a good quality helmet that will properly protect my head. Check it out. The pre-order is only available for a little longer. When you put down a $98 deposit, they’ll also give you a $100 off early bird special. $400 due on delivery + shipping and handling. Round 10 is right around the corner. We’ll be back at Marina on Sunday (7-19-2015). C-Street 1st place is already locked up, but 2nd place is still up for grabs and the competition is tight. Dennis and I will be looking to give the new set-up a try. Dennis added Koni Yellow shocks onto the BRZ. The hope is that we’ll have a more aggressive suspension platform which will hopefully equate to lower times. I am also planning to test RaceChrono. Hopefully it’ll go smoothly and I’ll have some good data to overlay onto the videos. A lot of the set-up is a one time deal. However… plotting the course is going to be the hardest part. The good news is that defining the course can be done retroactively after the event. As always, if you are interested in giving autocross a try, hit me up. Autocross is extremely accessible and is open to anyone that has a safe car and a drivers license. I haven’t driven my Impreza in awhile and would to toss that guy around. Also hopping to fine tune the data overlay/data logging system. There is a possibility in August that I might try to make my way out to Thunderhill for the SCCA Track Night. I’ve heard great things about Track Night from friends and wanted to give it a try. I can’t really say much about it, but from what I gathered, Track Nights borrow the concept of Wednesday Night Drags or Drift and apply it to the track. As a result, it offers a great venue/opportunity/gateway for people to experience track days and/or amateur or grass root racing. Looks like this event is having a promo price of $125. That’s definitely more appealing. I have a little PTO that I might be able to use. Maybe work half a day, then make my way up to Thunderhill for a 3PM start. After many years, my uncle has shipped me the Porsche. The back story is that my aunt and uncle have owned the car since it came out. For the last 10 years, it has sat in the very same place in the garage. After years of not moving and nagging from my aunt, my aunt and uncle decided to give it to me. I am definitely looking forward to it. I don’t really have any plans for it yet. I hope to just restore it and/or bring it up-to-date. I really wish that I didn’t come across the Spec 944 racing page… Apparently the 924S is a legal platform for NASA Spec 944. Time to work toward a race license??? Anyways, that will be here on Monday or Tuesday. Not sure what condition it is in, but probably will have to spend some time getting it up and running. It could be a fun autocross car. Since my last update, I’ve added some more updates to the guide. Most of the updates are in regards to the usage of RaceChrono. The guide is hardly in the finished state. Content is constantly being added or revamped to be more detailed and more clear. I am looking forward to the next autocross to see if this system actually works. We’ll really see. Anything to make the data overlaying easier is a plus. With Torque, I was constantly weeding through data in order to overlay it onto GoPro footage. Hopefully with this system, it will allow us to overlay information a little easier and more efficiently. The next autocross event is about 2 weeks out. Definitely still some time to figure this stuff out. Just a heads up to everyone that I made some updates to the guide. I added a section for the RaceChrono app. It seems that app has the ability to let you define a track instead of selecting one. I played around with it a little bit, and as far as I can see, you can use it for autocross purposes. When walking the course before your runs, you just need to define a “start” and a “finish” and you are all set to go. It isn’t Solostorm, but for $4 + the cost of the bluetooth GPS and bluetooth OBD2 connector, it isn’t a bad way to go. I think RaceChrono is going to make it a lot easier for me to not only export data, but also compare runs. Check out the whole guide here. Skip to section IV for the updated RaceChrono information. Still a work in progress, but it is coming along. Round 9 is now in the books. Another great event at Marina! I thought the course was awesome, though, it was a course that rewarded cars with horsepower. It was definitely a lot of fun and was very fast. I was actually bouncing off the rev limiter in several places on course. The course was a great hybrid of the last two events at Marina. As you might have seen in the videos of my run, there are definitely places where a little extra power would have helped. The BRZ is such a great cornering car, but there are times where it struggles against higher powered cars. The turn-arounds and sweepers were those places on Sunday. The good news was that the whole class was compromised of FRS/BRZs, so everyone had that problem. My fastest run was a 43.4XX. That seemed to be the wall that I was hitting. My second run and third runs were 43.4xx and both were separated by 3 thousands of a second. I just wasn’t able to find any more time for my 4th and 5th run. I thought that I was doing pretty well on my 4th run to only DNF at the end. As for my 5th run, it was only a little slower than my second and third. All and all, I had a pretty good day. I thought I put down a pretty good time, even though I wanted to go faster. I think after two runs, I was sitting in first place, but my other competitors were able to put down some faster times. Bummer, but that’s racing. In other news, I think I need to buy a new tire pressure gauge. I have seem to have lost my gauge. 🙁 Maybe it is time to upgrade to a Longacre gauge?? I bet you that as soon as I get a new gauge, my old one will turn up. The season is starting to wrap up. According to the calendar, there are two SCCA events left for the championship season. There’s one event at Marina in mid-July and another event at Crow’s Landing in August.